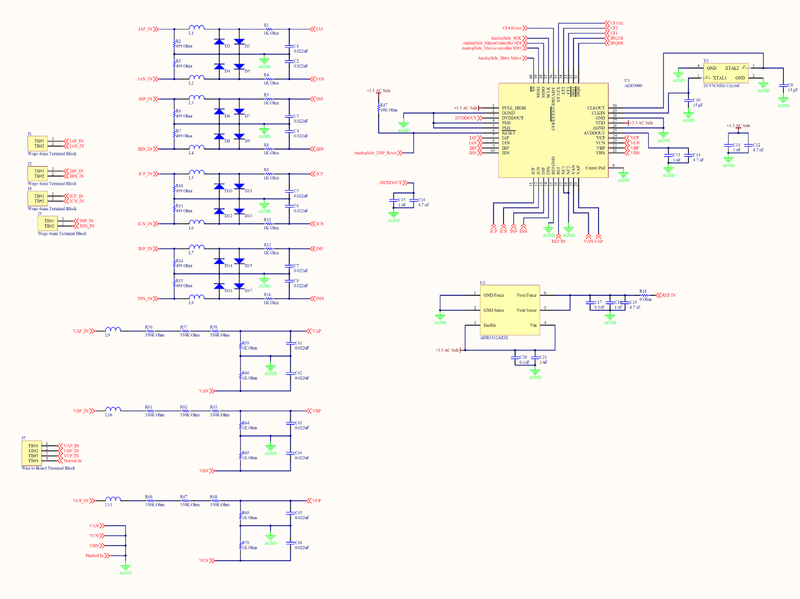 We have a new design using the ADE9000 that is based on the eval board. We can read voltage and current but we have a strange situation with reading current channels. We are connecting the same single phase voltage and current sources to each channel for testing and calibration. Voltages are connected in wye configuration with A,B, and C connect to voltage sources and neutral connected to ground. Voltages work fine. For current, if we have connections to IA, IB, IC, and IN, then channel B reads 0. If we disconnect channel A, then B reads correctly. We can't understand what is happening. We have traced and verified continuity and checked for shorts on the board and the connections. For configuration, we are only changing two registers: VLEVEL and ACCMODE to allow for 120V and 60Hz respectively. All other registers are using the defaults. Our current setup is testing a load of 0.5 Amps, but we can adjust as necessary. Just wondering if anyone has experienced anything similar? Any help or thoughts for troubleshooting are greatly appreciated. In order to help you better, please show me the schematic of your connection, so we can check if there is something wrong in your connection. Thank you very much. Thanks for the request. I am including the schematic for our design. Let me know if you have any questions about it. Thanks for looking into it. Further testing has revealed more information. With channel A, B, C connected, channel A and C reads 0.5 amps and channel B reads 0. With channel A disconnected, channel A reads 0 and channel B and C reads 0.5 amps. With channel B disconnected, channel A and C read 0.5 amps and channel B reads 1.0 amps. With channel C disconnected, channel A and B read 0.5 amps and channel C reads 0. According to your circuit, I first recommend you to replace the resistors at Current channel, you use 499+499= 998 ohms in your application, that means a small current value change will cause a big voltage change between R2 and R3, sometimes you may exceed the maximum range of ADC. By the way, what current sensor do you use? Please tell me the conversion parameter like Current Transformer or shunt and so on. Thank you very much. Thanks for the recommendation. We had, in fact, already noticed the incorrect values of the resistors for the input network. We have already replaced them with 4.99 Ohm resistors. I have tried pulling the normal filtered RMS, the 1/2 RMS, and the 10/12 RMS current values and all are in agreement. Our conversion of the ADC value to a current is accurate, it just has the weird problem with either canceled out or additive values for the B channel when certain connections are present or absent.